We were thrilled to be chosen by the Houston Downtown Management District for the latest Main Street Marquee. 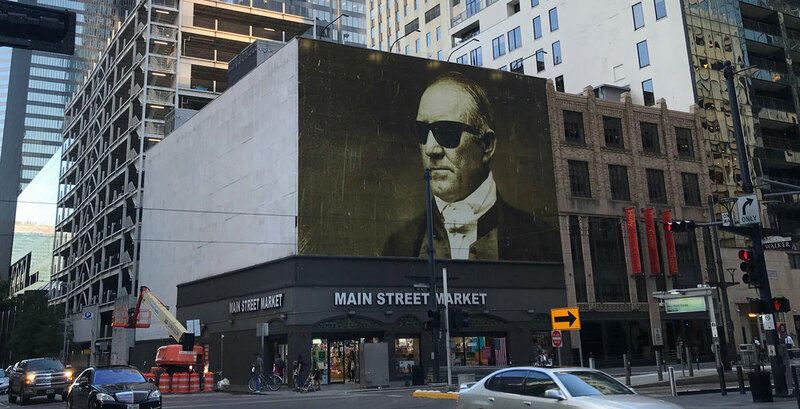 Our altered photograph of General Sam Houston is a billboard-sized image installed above the Main Street Market in Downtown Houston. The Main Street Marquee is part of Art Blocks at Main Street Square, a public art initiative that has filled the three-block pedestrian plaza with a series of site-specific installations. James Glassman’s work for the marquee, titled Sam Houston Style, is a portrait of the city’s namesake wearing contemporary sunglasses. Glassman digitally altered the original 1850s Mathew Brady photograph as a tongue-in-cheek tribute to the famed governor and military leader, who looms large in Houston’s history. Sam Houston’s leadership through his heroic acts and unwavering confidence embody the City of Houston ethos, and his example continues to inspire today’s Houstonians. With this installation, Glassman reminds everyone that history is lurking around every corner. Art Blocks is curated by the Downtown District with the help of community leadership and project consultation by Weingarten Art Group. Other projects currently on view include Trumpet Flower, a sculpture and shade structure by Patrick Renner and Flying Carpet, at Main Street Square. Sam Houston Style remains on view through April 2019.